Weaving is one of the earliest basic crafts; its origins can be traced back many thousands of years. Weaving is a method of creating fabric by interlacing two sets of yarn threads at right angles. The lengthwise threads are called the warp and the second set of threads crossing them are called the weft. The warp threads form the base for the weaving; they are arranged parallel to one another and are held in tension on a loom. The weft is a single thread that is passed over and under the warp threads in a systematic way to create a solid or patterned piece of cloth. Weavers working on large pieces use the treadle loom, a large machine that holds long warp threads and can make quick and complicated changes in the placement of these threads to allow for many patterns. At Aries Weavers, I used a treadle loom to create all the pieces you see here today. Another type of loom is the frame loom, commonly associated with the Navajo rugs we see in the Southwest. Frame looms are also used to make tapestries and wall hangings. Weaving on a loom is different from other methods of fabric manufacture, such as knitting or crocheting, which consists of interlooping one or more threads of yarn; and braiding, which consists of interlacing several threads of yarn. Weaving fabric with a treadle loom involves several steps. First, the warp must be threaded onto the loom and held under tension; this forms a surface of closely spaced, parallel threads. To begin the process that produces the fabric, a shed must be opened. In plain weave, every other warp thread is raised. The space between the raised and unraised warp threads is called the shed. Next, a tool called a shuttle pulls the weft thread through the shed. Then, the beater forces the weft against the previously placed threads to form the fabric. Finally, the raised warp threads are lowered, and a new set is raised in preparation for a new cycle; this locks the weft into place, above certain warp threads and below others. At the back of the loom is the warp beam around which the warp threads are wrapped and kept under tension. Periodically, the warp beam is rotated to feed more warp thread as finished fabric is created. Between the beam at the back and the fabric in the front, each warp thread passes through a small eye set in the middle of a vertical wire called a heddle. Groups of heddles are connected to a wood or metal frame called a harness so that the group of heddles, together with the warp threads passing through the heddle eyes, can be raised or lowered in a single operation. For fabrics more complicated than plain weaves, more sophisticated looms are required. The difference lies in the operation of the harnesses. A two-harness loom—that is, a loom with two sets of heddles, can only produce a plain weave. Twill fabrics require looms with three or more harnesses, and other types of fabrics may need a minimum of five harnesses. The first move toward mechanization of the loom was the flying shuttle, patented by John Kay in 1733. The first successful mechanized loom was perfected by another British inventor, Edmund Cartwright, in 1786. In subsequent years he and other engineers made improvements on the loom, and by the early 19th century the power loom had come into general use. The Jacquard loom was perfected in the early 1800’s by the French inventor Joseph Marie Jacquard. 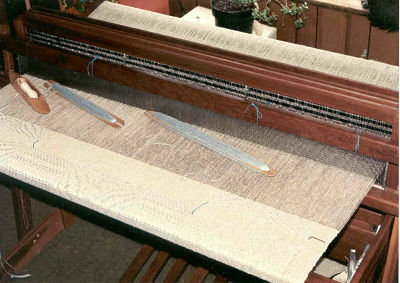 In this loom, the heddle harnesses were absent; the individual warp threads were controlled by a series of upright wires that were attached to the Jacquard head high above the loom. The weaving process was controlled by a series of cards with holes punched in them that corresponded to the weave pattern. A space could be punched or not punched for each warp thread position. (The original computer punched cards!) The cards were fed through the Jacquard head at the rate of one card for each pick of weft. The presence or absence of holes in each card determined whether each warp yarn was raised or lowered. Extremely elaborate weave patterns could be produced by this system.